What can we bring you from North America? What can we bring you from North America ? When I first moved here, there was literally NO brand named products in the stores; NONE. It was very basic. Every time we had someone visit us from the USA or Canada, we would have a long list of items that we needed them to bring. Spices, Peanut Butter, BBQ sauce, Candy and more, were common requests to visitors. 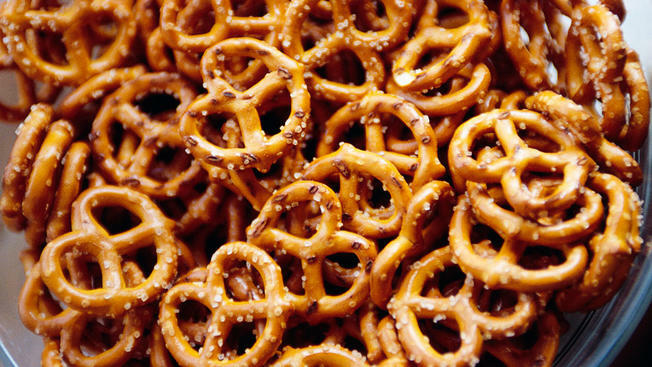 One of my addictions is pretzels. It is something that I have always loved, and it is my personal choice for a snack. I remember in the old days, we treated them like gold, hoarding them, and counting them, and only sharing them with our closest friends, as we didn’t know when another visitor would reload our stash. We would have private pretzel parties, seriously, as they could not be found anywhere in Costa Rica. One day, about 2004, I get a phone call from an old friend of mine. She was another pretzel nut, and was one of the very few I would open up my personal stock with. “Don’t tell anyone” she said, “but there are now pretzels at the market. But hurry up; there are not many bags left. I bought 6 myself and they are running out.” I turned my car around, like Starsky and Hutch, and raced back to Coco and ran into the store. There were only about 5 left, and I grabbed every single one. As I was checking out, other addicts came sprinting down the aisle, suffering violent withdrawals when they realized they were all gone. That quickly, they were out of stock and it was months before they came back. Captain Crunch was another luxury that I just seemed to crave. It is funny how you never really care much about something, until all of a sudden; it is nowhere to be found. Over time, as more and more Ex Pats moved here, the markets started stocking up on items that you would see in a grocery store back home. Today, you can find almost everything in the Auto Mercado and Luperon Grocery stores, on the main drag of Playas del Coco. Some of these products are a little more expensive than back in North America, as they had to be shipped here, but the shelves are stocked, do not worry. And if you want something bad enough, you don’t really care what it costs. Clients ask me all the time, if they can bring me anything from home; if there is anything I need; or something that I would like. I always tell them, no; thanks very much, I am fully stocked up. Many of my clients, though, still feel like that have to bring me something as a token of their appreciation. I receive dozens of T-shirts a year, from local sporting teams, rock n roll concerts or town events that they attended. I am very appreciative of all this love, THANK YOU. So if you MUST bring me something, then here is what you need to know. I wear an XL T-shirt. My dogs can always use treats. And you can never EVER go wrong, bringing a box of Large, Hard, and Sourdough Pretzels. They will be thoroughly enjoyed with a tub of cream cheese and a sporting event on TV. THANKS.